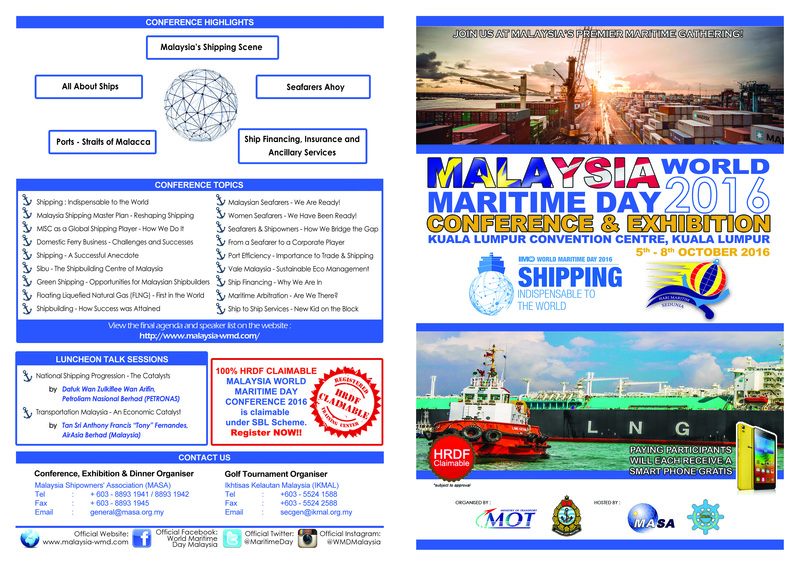 In conjunction with Malaysia’s celebration of the World Maritime Day (WMD) 2016, MASA is pleased to inform that this year’s WMD celebration will be held at the Kuala Lumpur Convention Centre, on the 5th and 6th October 2016. This year’s theme, as determined by the IMO, is “Shipping – Indispensable to the World”. It is one of the most anticipated event by Malaysia’s maritime industry, with active involvement of exhibitors and the public. In consonance with this year’s theme, speakers from around the globe will share their valuable insights during the conference sessions and very encouraging participation by Malaysia’s maritime industry players are expected in our exhibition displays. This year we are taking this event one step further. 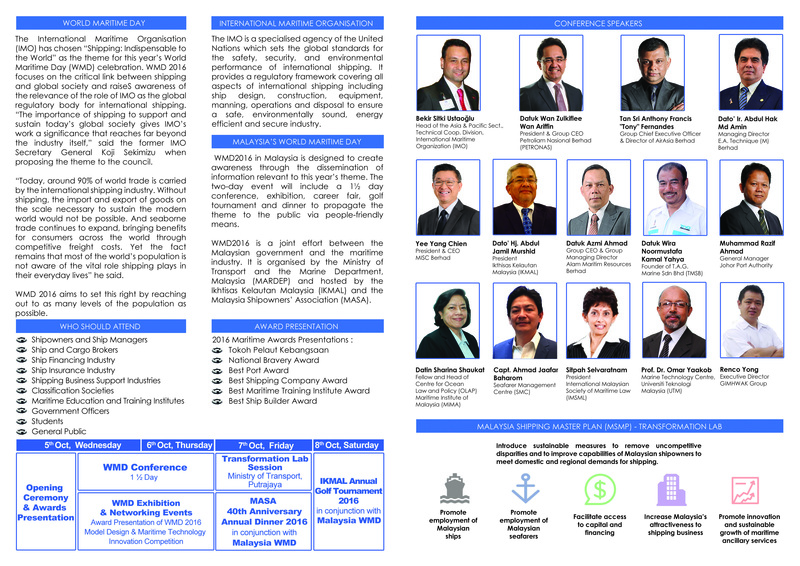 Realizing the need to bridge the gap between Government and the industry, WMD 2016 will showcase a series of speakers with vast experience in a myriad of maritime sectors sharing their knowledge and wisdom. Transformation lab sessions to further explore potentials in areas where Malaysia can capitalize will be organised. This event will gather the key people of the maritime industry, including government officials, Managing Directors, Chief Executive Officers from maritime related industry as well as other stakeholders. The 4-days event includes a conference, exhibition, transformation lab sessions, dinner and a golf tournament to disseminate the theme to the public via people-friendly methods. It is jointly organised by the Ministry of Transport (MOT) and the Marine Department of Malaysia (MARDEPT), with the conference, exhibition and dinner being hosted by the Malaysia Shipowners Association (MASA) and the Golf Tournament by the Ikhtisas Kelautan Malaysia (IKMAL). ❑ Find out more about our event via our WMD General Brochure. Click HERE to download. Do visit WMD website at http://www.malaysia-wmd.com/. Grab the chance to be part of the conference. The one and a half day world-class conference will take place at the Kuala Lumpur Convention Centre (KLCC) on October 5 & 6, 2016 and will witness the presence of over 20 industry experts – locally and from abroad – who will take on key roles as speakers, panellists and moderators. The event aims to attract over 1,000 participants for its 20 highly interactive and content-rich sessions. Click HERE for the registration form or contact Pn. Sharimah Abdullah or En. Audi Zharif at 03 – 8893 1941 / 1942 or drop us an email at general@masa.org.my or wmdmalaysia@masa.org.my. Registration forms can be downloaded HERE. For more info, please refer to the link given HERE. This conference is 100% HRDF claimable under the SBL Scheme. Be a part of our WMD EXHIBITION to showcase your products and services. Please click HERE for the registration form or contact En. Fairuz Ramdzan or En. Shahkiman at 03-8893 1941 / 1942 or drop us an email at general@masa.org.my or wmdmalaysia@masa.org.my. You may click HERE to refer the exhibition booth layout plan. Do visit our booths where we shall be having activities such as product and career talks. There will also be lucky draws and quizzes in which you can participate. Grab your chances to win branded laptops, tablets, smart phones, etc. You are cordially invited to attend MASA’s 40th Annual Dinner 2016, held in conjunction with Malaysia’s WMD Celebrations. We shall be serving you a fantastic dinner and exciting entertainment programmes by accomplished performers. Join us in this blissful occasion and stand to win lucky draw prizes, including mysterious grand prizes. Contact Pn. Faridah or En. Audi Zharif at 03-8893 1941 / 1942 for more info. Email us at general@masa.org.my or wmdmalaysia@masa.org.my for further enquiries. Layout plan and further details can be referred HERE. Join us at the lab session which will be held at the Ministry of Transport, Putrajaya, as we gather C-suite level decision makers from the industry for an exclusive dialogue on Malaysia’s Shipping Master Plan (MSMP) aimed at introducing sustainable measures to remove uncompetitive disparities and to improve capabilities of Malaysian ship owners to meet domestic and regional demands for shipping. Contact person in charge, Miss Sajidah at 03 8892 1305. Further details on the event can be refer as follows HERE. Don’t miss the chance to participate in IKMAL’s Annual Golf tournament 2016 and stand a chance to win great prizes. For more details/registration, please contact IKMAL’s office via email at: secgen@ikmal.org.my or telephone:+60355241588. Contact Person: Capt Abdul Aziz Abdullah. Registration form can be referred HERE.